The concrete here looks like the work of A. Salamid, but Pat photobombed his job. This mark appears to be the work of professionals, but the names aren’t familiar. With this mark, I finally have a date for this guy. A very late mark from the last wave of the Tribuzio dynasty. I believe this is the only concrete stamp on all of Mandela. It sits next to the American Steel building, and somehow it escaped the repaving after the 1989 earthquake. I think this group must have been the developers of the site. Wikipedia tells me that the firm was the developer of the Cypress Structure, although that contract started in 1956. 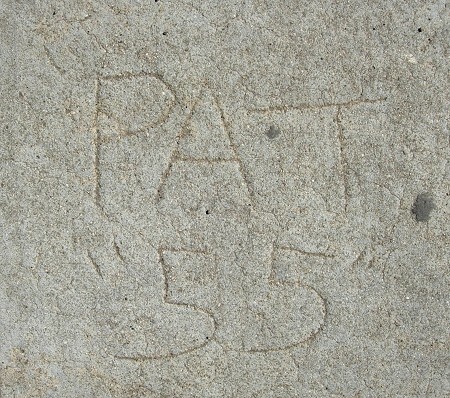 I believe that these are birth marks, placed along the curb to note the births of Mike and Steven Real. 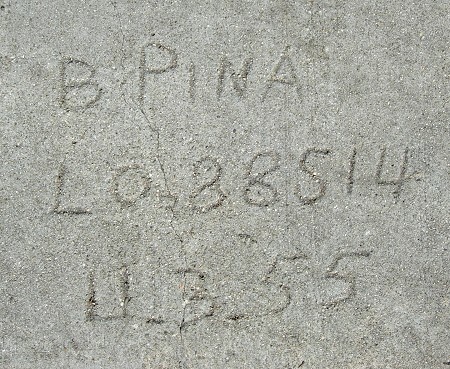 They consist of a name on the top, a date in the middle, and what looks like the birthweight and the time of birth on the bottom. Pretty cool. R. G. Wolfe remained meticulous in his stamping, using metal numerals instead of scratching a number as most sidewalk contractors did (and do). A shame that whoever cast his stamp cobbled the “R” together from a “P” and something else.